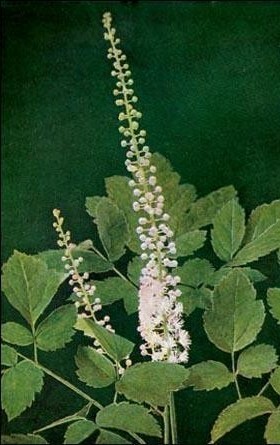 Medicinal Properties & Uses: Black Cohosh root is considered astringent, emmenagogue, diuretic, alterative and expectorant. It has been used in America in many medicinal preparations, but is typically used as a combative agent against poisons and rattlesnake bites. With many qualities similar to that of the hormone estrogen, Black Cohosh has been utilized in preparations for treatment of menopausal disorders. During the 1950’s, German gynecologists began using it as an alternative to hormone treatment in menopausal patients. Forty years of studies have provided clear scientific evidence that it can effectively reduce the severity of “hot flashes” and depression during the onset of menopause. Dosage: 15-30 drops in juice or water, 2-3 times daily or as needed. Shake well before using.